Roy, born 1930, is a retired Chartered Engineer, a Fellow of the Royal Aeronautical Society, with a long career in the design of transport aircraft, and practical piloting skills. He has constructional hobbies, making anything from working models of all kinds, including steam locomotives, to life-size gliders, aeroplanes and boats, also skilled in practical building and repair jobs. Ann, born 1932, is a doctor's daughter with a wide range of skills and qualifications, used in self-employed work. Her university career was ended by serious illness, deemed terminal when diagnosed, so she has a degree in 'life and death' rather than the usual paper qualification. 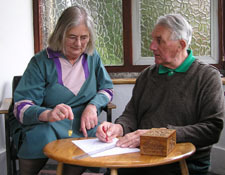 Past involvement in antenatal and stress management teaching groups led on to further training and a social worker job in a psychiatric hospital, then training in counselling, psychotherapy and psychological astrology, until recently registered with the United Kingdom Council of Psychotherapists. She manages a large garden and used to keep bees. Their two daughters have produced five grandchildren, an education and joy for all concerned. Both are very experienced dowsers and healers. They have been teaching these subjects for over 30 years based on extensive practice. Both are registered healers with the National Federation of Spiritual Healers, and on the professional register of the British Society of Dowsers. They were Trustees of the Chalice Well in Glastonbury for many years.